Birthdate: January 14, 467 R.C. (776 U.C.) 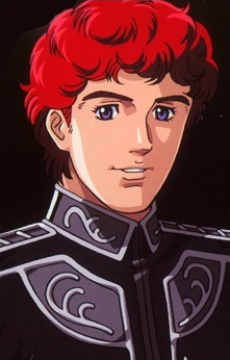 Siegfried Kircheis is a young captain serving in Reinhard’s fleet, as well as his best friend. Born a commoner, Kircheis first met the future Reinhard von Lohengramm when they both were about ten years old. Reinhard’s family had just moved in the house next door, after introducing themselves to each other, Reinhard declared that Siegfried was a very common name and from then on he would call him Kircheis which sounded better, the two immediately stroke up a friendship that was to last for life. When the emperor took Reinhard’s sister to be his concubine, Annerose asked Kircheis, who had an innocent crush on her, to promise that he will always be by her brother’s side. Kircheis kept his promise, he followed Reinhard in the military and together they rose through the ranks facing many trials, eventually Reinhard was made a count and was awarded the command of a fleet, opening their road to power. Kircheis is an excellent tactician, often able to discern and even predict Reinhard’s elaborate battle plans. A kind person and a dedicated friend to Reinhard, he is always by his side, and goes on the fight alongside him in his red coloured battleship Barbarossa. He often acts as a restraint for Reinhard’s ambition as well as his wrath when his arrogance gets the better of him. He believes both in Reinhard’s abilities and the righteousness of his intentions and his only goal is to help Reinhard fulfill his destiny.